You may not be aware of it, but dental professionals everywhere recognize that cheese—all kinds of cheese—is a super performer when it comes to preserving long-lasting oral health. Long-term studies of people who follow cheese-rich diets such as the Mediterranean Diet have found that tooth decay is significantly reduced in people who regularly cap off a meal with some type of cheese. Most of us tend not to follow that custom, which is unfortunate because the American diet routinely includes sweets, citrus, soda, bread, and crackers – a veritable plethora of foods that expose teeth to a steady bath of decay-causing acid. That’s why eating a bit of cheese at the end of a meal or sugary snack is so important. Cheese can actually counteract the acid left behind by those foods. In fact, it has a penchant for going after those bully acids and neutering them. A single cube of aged cheese goes to work immediately to increase saliva – a natural flow of mouthwash and acid-neutralizer that effectively washes food particles out and away from teeth. Cheese keeps on working even after you’ve finished the meal, providing a temporary coating of calcium on teeth that not only immediately helps to protect against acid, but goes on to help harden tooth enamel, actually filling in minuscule surface nicks (i.e. burgeoning cavities) to prevent future decay. By the way, calorie-watchers please note that a single cube (an ounce or less)) of aged cheese is—by itself—all you need to clean and clear your mouth after a meal or sugary snack. What Kinds of Cheese Do All This? All kinds of cheese, really, but aged cheeses are especially helpful – Cheddar, Swiss, Blue, Monterey Jack, Brie, Gouda have all been shown to reduce cavities. Low-fat varieties such as Parma-Reggio and Asiago are also effective as dental and diet-friendly superstars. For some sage advice on creating extraordinary cheese courses, we’ve enlisted local cheese monger Mary Gonsalves, who, with chef-husband Robert, owns Bloomy Rind, Hingham’s popular farm-to-table cheese emporium. 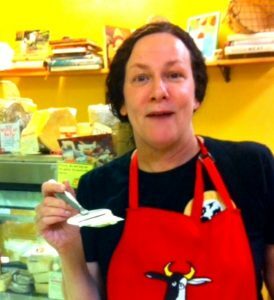 Mary trained in the U.S. and abroad and knows a thing or two about tantalizing cheese courses – both lavish and simple. Following are a few of Mary’s creative suggestions for tasty (and healthy) cheese plates. The perfect end to a meal is a savory/sweet cheese course – part dessert, part palate clearer. Try pairing a soft cheese such as Moses Sleeper from Jasper Hill Farm in VT with Bay Blue cheese from California. Add cherry thyme jam, dried fruits and nuts, and a French baguette to the tray for a sumptuous end to any meal. Don’t pair grapes with wine in a final cheese course – they’ll clash. However, jams, quince paste, nuts, including Marconi almonds, walnuts, Brazil nuts, and pecans work wonderfully. Pair your wine according to your plate selections and personal taste. 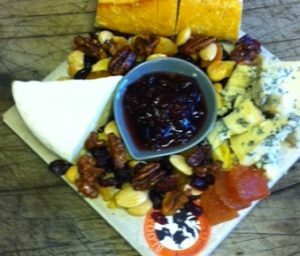 Treat yourself with a luxuriously healthy, non-dairy individual cheese plate using sheep and goat cheeses. Both are delicious and particularly high in calcium. Pair them with nuts, fresh grapes, apples or pears – superfoods that double as superb cleaners for teeth. Finish with a cup of green or white tea to further promote remineralization and you’ve hit all the bars for a delicious spa-worthy treat. For kids, simple but tasty snacks work best. A plate of artisanal chedda r from Vermont, fresh apple slices, and roasted Marconi almonds is a proven winner with most kids. If a kid (or an adult) simply isn’t cheese plate lover— try grilling sourdough bread with cheddar, Gouda and aged Fontana for a gourmet version of that universal favorite – the grilled cheese sandwich.